Now first the results. 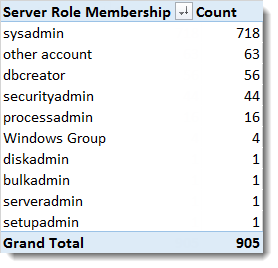 I received data from 58 different servers and 905 databases altogether. That’s not bad, and sufficient for my purpose of giving you, my readers, the opportunity to find out how others configure their servers. 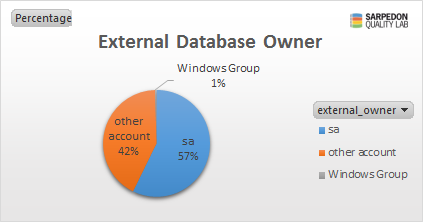 57% of all databases belong to sa itself. Actually, this is better than expected. But let’s dive deeper – what’s the server role behind the remaining 42%? Then some other accounts follow, which means those have low privileges (“excellent”), and then comes dbcreator, securityadmin, that are later followed by some other high privileged server roles, though with much less power. So in other words: only 7% of all those databases have been looked at with security in mind by only using low privileged accounts as owners. Since the system databases need to have a different setting by default, I am excluding them, making it a total of 847 User databases. 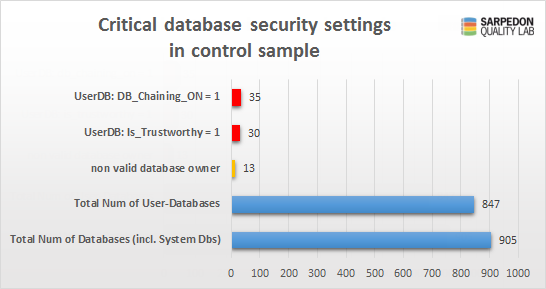 Of which 30 have the trustworthy bit set to on, and 35 have the database chaining. First: If you think about it, it actually makes little sense that the highest privileged account in SQL Server is being recommended by so many, even professionals + in Whitepapers (!) – when security is the focus. It is really wrong, as wrong as it could possibly get. I mean, as you can see, there are other options out there. The top reason why SA keeps getting recommended is administration itself: It eases the setup for failover and regular database restores, since SA is always available at any server and hence a broken database owner can be avoided with almost no extra work. But that’s “only” from a perspective of maintenance. With regard to security it is totally on contrary to the Principle of least privilege. It may not matter a lot, if everything else is tightened, but that’s hardly a thing to rely on especially in bigger environments where things change and many people have access and permissions to. Especially in the context of the trustworthy-setting for a database, this completely opens the system for privilege escalation attacks from inside. It is then a piece of cake to gain system level permissions once you are for example in the db_owner database group – like many applications are, if they are not sysadmin already. – Remember: the owner of a database cannot be denied anything inside and with his database. So he can change structure, create backups, break log-backup-chain and also drop it completely. And since the attack starts from inside, it really doesn’t matter whether the sa/sysadmin account is disabled as you may now realize. 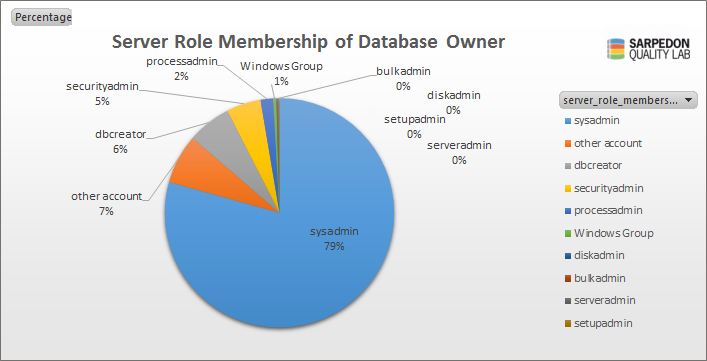 Having a dedicated account with zero special permissions as database owner prevents database principals from gaining system level permissions as a sysadmin has, even in the case of the database being trustworthy. And trustworthy is one of the dirty little shortcuts for developers implementing CLR code inside the database and avoiding the hassle of having to use certificates under certain conditions. The same is often done for code that needs to get server-level data from inside the database. Check your databases. You can find my script here: Security-Check-Script & Survey: SQL Server Security – Database-Owners, critical Permissions and role membership Now when you start with securing your databases from database-ownership standpoint, you have to make sure that the very account does exist at any sever where this database gets restored/failed over. Usually you will have a technique in place already to synchronize your server-level principals to your other servers. So this is just one or several more of them. Also make sure you fully understand your environment and possibly application needs before you just change the owner of your databases. You can start by reading through the links at the bottom. Vote for an improvement in SQL Server: I have created a suggestion as Connect Item which tackles this problem. My idea is having Microsoft include a special “DBOwner” Account at server level by default, which not only pre-exists and has not permissions, but also never compares to another. I think this would make it much easier to get rid of the habit of “sa” everywhere by also making it simple to maintain. Was the Connect item you link to closed by Microsoft before they migrated the issues over to UserVoice? I can’t seem to find anything at UserVoice in order to vote it up. Not sure if it’s worth recreating? as I am now part of that very Security Team of Microsoft, I do not need to recreate this. The whole subject of SoD is on my desk, and this certainly touches it. On the other hand it is certainly helpful if people like you from the community keep reminding us (and my superiors) of what you feel is important. I’ll do my best to tackle this problem, but I cannot commit to any timeframe. I have a question about this. I have a bunch of databases that are “owned” by a specific user (domain\username). That user no longer works there. I have a few questions about having a disabled ‘sa’ (or any disabled sysadmin account) be the owner of a database. 1. The fact that the ‘sa’ account is disabled…will that effect proper functionality of the database? i.e. backup/restore, normal read/write activity etc.? 2. If not, can this change (from domain user to disabled-sa) be made ONLINE? or will it have to be during a maintenance window? 3. Can you talk a little about what EXACTLY this “owner” is there for (especially when the owner can be a disabled sysadmin account)? It’s a little confusing for me. thank you for your patience and reposting this question here. This helps me to remind all potential readers, that DISABLED accounts only protect from logging in from outside. Bu the account is still very much “alive” and can be impersonated just like any other account. So what really matters is that that account has no elevated permissions himself. I do realize this subject is quite confusing (and not explained in a simple way). Maybe it need another blog.. It is perfectly possible to use ANY Windows Account (disabled or not) that is NOT a Login in SQL Server and use it as a Database Owner (Via ALTER AUTHORIZATION as well as the old sp_changedbowner). Can be either a Local account or a Domain Account. The GUI will complain because it does some extra checking. This is clearly against documentation. And the fact that it works pre 2012 implies that it is not to support SQL Azure Database (where this might make sense). So, in my eyes, it must be a bug. I have asked the Microsoft SQL Server security team and will let you know when I have news.